Trying to navigate through the hype and fanboyhood that surrounded this juggernaut, I opted for the 24fps 3D version of the film. Reading through several reviews that panned it, I couldn’t bring myself to sit through 2:50 hours of “soap-opera” effect, but I like 3D so that worked for me. Without going through a comparison to the novel (which I didn’t read), it’s still easy to see that this has taken the source material and stretched it as much as it could. By comparison, the entire The Hobbit novel is shorter than the first Lord of the Rings book, so consider the material that fueled the first movie in LoTR trilogy, cut away some 200 pages, then split that in 3 and make a movie out of each part - that’s the Hobbit. I’m sure financial or “fan service” considerations would have been in play when making this decision. 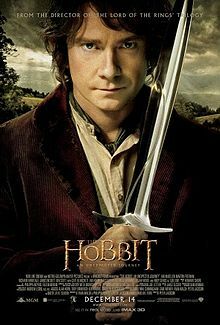 Maybe studio directors were thinking more about how many Hobbit figurines they could sell over the next 3 years than whether this was going to be a good movie. As for the film itself, it is of the same great quality that the first 3 LoTR movies benefited, albeit a little diluted because of duration. This could have benefited from some significant cuts. The usual culprit is the extended dinner/song/dance scene at the beginning, which honestly I didn’t find that long as it was happening, but which contributed to my indifference for most of what followed. I could mostly relate to Gandalf and Bilbo, most likely because I like both actors portraying them, but except for them, most of everybody else was forgettable. As for the CG creatures, Gollum excels again as always, and I did like the Great Goblin which was a filthy yet entertaining bit of goblin royalty. Plot-wise, if this wasn’t based on a book, it would be risible. Gandalf and the great Eagles act a bit too often as a deus ex machina, and some obvious choices seem like they were made for the sole reason of filling in some plot. The most glaring example, like in LoTR, is the Great Eagles fallacy. in the words of the great philosoraptor: “At the end of lord of the rings frodo Gets eagles to fly him back - Why didn't those sluts fly him there in the first place”. But I digress. Overall this was enjoyable, if a tad long. I’ll probably watch the other 2 films, and maybe give 48fps version a shot at some point as well, if I feel really bored. Essentially this is more of the same LoTR goodness, so if you loved those, be sure to not miss this as well.